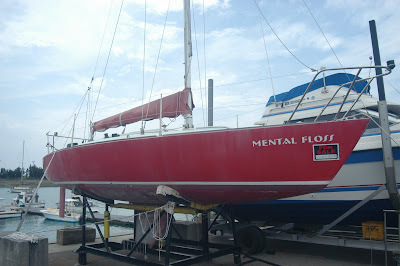 On May 30, 2008 -- Bought the boat. Agreed to meet JH's representative at Camp Foster's Joint Services Vehicle Registration Office here in Okinawa because he had the day off. (Basically a four-day weekend). On the way to meet him, I wonder if the military person had the day off is the JSVRO is closed today too? Try calling to no avail via my cell phone. Then I call the legal office to see if at least we can get the Bill of Sale notarized. Some lieutenant colonel answers the phone (a little surprising since it's usually lance corporal so and so) he confirms that his office can do the notary service but not until the next day as all Marines in Okinawa have gotte a 96. (96 hours of liberty). I call JH's representative and cancel meeting and agree to meet on Wednesday instead. After a day of sailing aboard a Catalina Capri 18 rental at Kadena Marina with DR and TR, I stop to talk with TJ, a boat owner at the harbor. TJ tells me that "Mental Floss" is for sale. I kind of laugh and tell him that I still haven't got my Class II boating license for Japan. I think the guy will take "$$$$" for it he says. Wow that is a great price I think to myself. My interest still isn't totally picqued until I sit down with DR and TR at lunch at the Seaside Restaurant. And we start talking about the day's sail and how much fun we had. Then we talk a little about Mental Floss. Yeah, it'd be nice to own my boat, but that's about all I think about it.